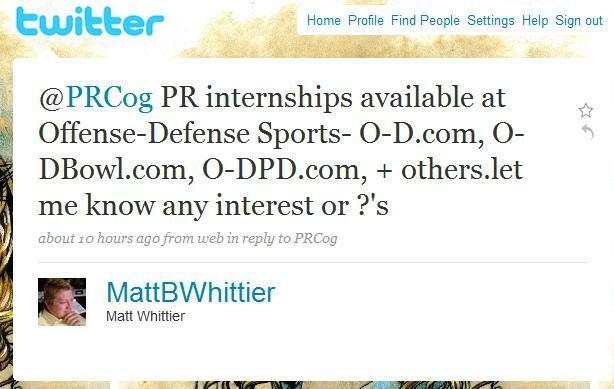 Midday yesterday, a number of the PR Pros I know began receiving @ messages from a Matt Whittier (@MattBWhittier) promoting internships at his company. 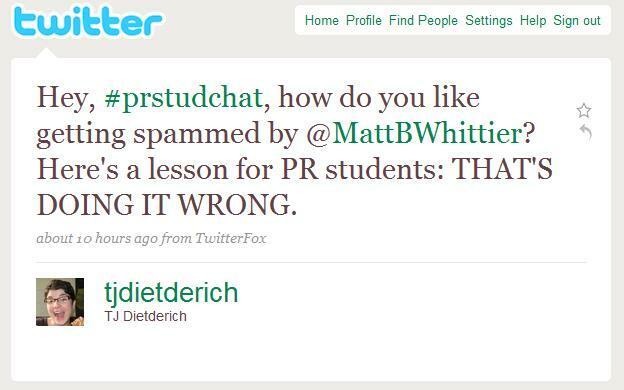 Given that a PR Student tweetchat was going on at the time it seemed vaguely appropriate. Though it seems Mr. Whittier felt it necessary to tweet me the information twice. I may have politely replied but for the most part I ignored the information since I’m not an instructor and am not seeking an internship. As it turned out Mr. Whittier had sent out this tweet 85 times (I’m not sure how many duplicates were in there) within approximately an hour. I’m not shy about talking on twitter but even I’m not that kind of chatty. Seizing upon this opportunity to teach a valuable lesson, our own TJ Dietderich pointed out to the students in the chat what isn’t accepted SM conduct. So it’s a safe guess she knows her shiitake from her shinola when it comes to Social Media. “Most of the people were thankful” — I doubt this, but it’s entirely possible. “Enjoy your day” — quite polite. “btw – do YOU have a job?” — Ummm, yeah, as previously mentioned…she’s paid and trained to do what you’re doing badly. And while we’re at it Mr. Whittier (and I’m pretty sure we’re going there anyway)…since you seem to be the SM guru at your company, how’s that LinkedIn profile coming? Are you going to have more than 1 connection soon? Pick your chin up, you opened the door. Seriously Mr. Whittier — that’s the public face you want to put on your company (and no, unlike you, I’m not asking about your avatar)? That’s what you want your clients, your employees, employers, co-workers and/or investors to see if they ever ask themselves, “Let’s see what Matt’s up to on Twitter? How is he representing us?” I’m all for using twitter to vent (understatement of the year)….but when you drag others into it by association it’s a whole different game. We’ll go further into this discussion in a bit, because if you (not you Mr. Whittier, I’m talking to the other readers now) think this was weird…let’s go back a few minutes in time and look at a post Mr. Whittier had made just moments earlier. Minute 1-60 — Mr. Whittier inundates all the flacks he can find with information about the internships. We’re allowed to make mistakes, learn from them and move on. Had it ended here, there would have been no brouhaha at all. For Pete’s (not me, FB friends) sake — I’m very happy that you believe in a higher power…Saying it after an apology, and then following it up with attacks as you did offends me generally. It’s as if you don’t even believe your own apology but slap on the ‘God’ sticker so people will go along with it. Tsk Tsk. To finish the story before getting into the PR discussion….I did feel the need to chime in at this point. I have no problem with debate, discussion, dialog….you want to go after a colleague intellectualy, get on with it, I’ll very possibly help. You wanna take the low road and do the above….I won’t have it. I still stand by the first one, the second one I think we’ve nearly put to rest at this point…and the last one….well my regulars know exactly what I was thinking. Mr. Whittier did grace me with a reply…. “It’s true, inquire within” — There’s a reason self-audited reviews are fishy. I still doubt that most people were thankful or interested. Maybe most people who responded were but I have trouble believing 43 PR Pros or Students responded positively. “Good one.” — Ummm, we’ve pretty much beaten to death in this discussion whether Mr. Whittier or Ms. Dietderich was the one conducting themselves professionally. “too bad….insight from you” — Thank you for the invitation to review your conduct in more detail on my blog. When you’re representing your company publicly — don’t be an idiot. Consider who’s going to see what you type. Are you ok with everyone you work with (both inside and outside your organization) seeing it? Are you ok with a blog response (like, I don’t know, possibly this one) being the first thing a new boss might see if they Google your name? When you’re representing your company publicly — don’t be an idiot (yes, same title, different reason). Look before you leap. And if you make a mistake, apologize and move on. (And apologize again if you need to until you get it right and can stop apologizing, or at least apologize less.) Don’t: apologize, move on and then attack someone for pointing out your error when you’ve already admitted mere minutes earlier that you made that error. It looks bad on lots of levels and you’ve already admitted to making a mistake so it sounds a lot like listening to a 4 year old who apologizes and then immediately repeats the behavior that he just finished apologizing for. I think we’ve sufficiently discussed the professionalism thing. There’s really too much to say on how bad this kind of conduct is. It’s social media…not sh&!ty media — interact, make friends, if you eff up, apologize and move on. I apologize many many times a day online. It bothers me each and every time I find out that I’ve inappropriately offended someone. If I still believe what I said, I’ll stand by it; if I was mistaken or rash, I’ll apologize. That’s the way it is if you want to get the most out of the sandbox we’re calling social media. It just astounds me that someone who takes on the responsibility of social media outreach for their company would do absolutely NO research on Twitter and how to use it correctly and efficiently. Did he really think that spamming people would get him anywhere? I was actually shocked when I looked at his profile and discovered that he was a real person, not a spambot. Shame on him for the whole situation, and good for you for calling him out on it. As PR professionals, we should all make sure that we’re doing our job right and respectfully. Jess took the words right out of my mouth – I am astonished that anyone using Twitter to promote their brand wouldn’t take the time nor have the inclination to first learn how to use this powerful tool. 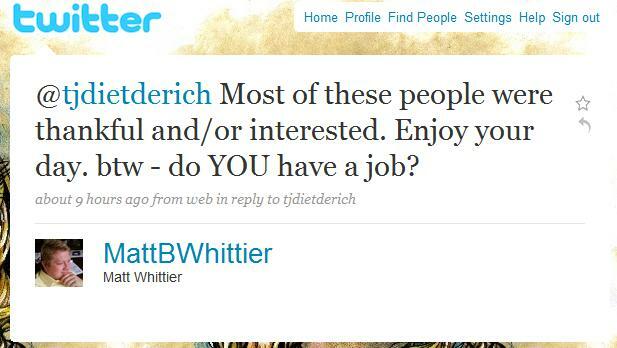 As a small business owner, I’m embarassed – I hope #prstudchat participants realize that not all small biz owners who do their own PR are as rude, unpolished and unprofessional as Mr. Whittier. As a PR enthusiast/new professional, I’m offended – since Mr. Whittier was holding himself out there as a PR pro (he was offering PR internships with his firm) – this behavior is downright offensive to the principles of good public relations skills. And as a PR “student” (I’m a career switcher and always learning) I feel violated and spammed -if Mr. Whittier took the time to read my bio (which contains a link to my LinkedIn profile) he’d have realized that I’d have exactly zero interest in an intership at this stage in my career, let alone one in-house at a small company where I’d have the chance to be mentored by someone who hasn’t the first clue about good public relations. What scares me the most is that some naive PR student will actually take him up on his offer – and learn to be a spammer themselves…. Thanks for this post, Cog, it had to be said. Great job. My thought – are people really that desperate for a job that they actually e-mailed him? Here’s the thing – Many PR pros are like this. They don’t understand platforms and how to use them. Every industry has them, but it seems that the PR world has even more. This might be because so many facets fall under the PR umbrella, and people just assume they are in ‘PR.’ The thing is, PR 2.0 is so hot right now that many use it without understanding. I wonder if he assumed we were all students because most were participating in the chat. Rachel Kay and I were both confused as to who was the professionals and who were the students. Does that excuse his behavior during and after? No way. He acted in an unprofessional manner and cast a bad light on the profession as a whole. He spammed people that are well respected in the space. Many students who have never had internships probably would take him up on his offer because they have no idea – and are naive and scared that they won’t find a job. Plus, we kept telling them in the chat that internships were key. So that’s what I did. Block and report spam. Perhaps I was too harsh by shutting the door on any future contact with Mr. Whittier, but I’d prefer to use Twitter to connect with competent people. Thanks for the great post, PR Cog! I’m not usually not a fan of public call-outs (more on that next week in my guest post on The Buzz Bin), but this one felt different. This situation went beyond someone making an innocent mistake, declaring “mea culpa” and moving on. The defensiveness and name-calling in his responses were not the words of someone who was sorry. They were the words of someone who was sorry he got caught spamming. Big difference. I don’t think I would have worded the call-out of the spamming exactly as TJ did … but I suppose, in many ways, that’s just a matter of personal style and preference. Cog, one criticism I’m sure you’ll face in all of this is that you operate online as a meticulously developed, carefully maintained anonymous persona, which makes it easier for you to call people out than it would be for the rest of us to do. However, I know and appreciate that you use this extra bit of power sparingly. It takes a pretty darn flagrant violation to get you going like you did here. By the way, I’d think that sending the same message publicly 85 times would be grounds for Twitter suspension. I haven’t read the ToS line by line — especially since I don’t ever plan on spamming people — but it’d be interesting to know. Nice post! I especially like the fact that you can insert the actual tweets, and they will forever remain in this guy’s body of work. One of the things I like about this space is that people who abuse it and act like idiots are called out. I think sometimes people forget Twitter is a “public place” and do things (I hope) they would otherwise avoid if they were physically in public. Mr. Whittier got his “15 Tweets of Fame” and if he has a modicum of common sense, he will go silent for a bit until he can figure out how to effectively be a part of this community. Wow, I was looking forward to this post as I missed all the action yesterday. I don’t have much to add, the others pretty much covered it. I am on the fence about publicly calling out those that make PR/social media mistakes – I mean, we’ve all made mistakes. However, considering this particular individual starting slinging personal attacks, I say it is fair game and a perfectly acceptable call-out. It astounds me that this individual is representing a company without displaying any tact or professionalism. Thank you for the post and bringing to light situations like these. It’s a great opportunity to learn from others mistakes and another reminder that as social media/pr reps, it is important to remember to think before tweeting. As a side note, I truly think it’s great that you are sticking up for your peers. Way to go! I suppose everyone makes mistakes, but I think it’s the way you handle your mistakes that set the tone for how someone sees you. That being said, the “sorry if I offended” tweet would have better served his and his company’s image if they hadn’t been surrounded by the snippy ones to @TJdietderich. Eeesh. I was part of the student chat & also got the message. OBVIOUSLY, I’m not a student. I did a snarky response to him, as I do to many of those who key-word auto messaging in Twitter. I call them out for not trying to engage. To me, Twitter has the great potential of interaction, but using it just to slam messages at folks makes it just another advertising vehicle. Hey Cog, I just want to thank you for acting as the rational reporter in all this. As Andy said, the only thing I could think to do was block and move on. People who choose to interact in such a way in a public forum aren’t here to learn a lesson or take advice; they’re here to be un-awesome. If my initial tweet about the matter sounded harsh to anyone, you have to understand that the odds of him being a bot looked quite high. Strangely, I’m even more disturbed that a real human thought these tactics were sound. I mean, while copying and pasting all those random messages, wouldn’t even the most hardened flack get a twinge of guilt in their middle? Anyhoo, yes, thank you for using your powers for good and not evil, Cog. The “Call Out” is always a risky move, and one I hesitate to make, as we’ve all erred at some point in our lives, egregiously at times. And with Social Media, the rules and etiquette are poorly defined and still evolving. That said, I condone this “Call Out” wholeheartedly. What took place was more than just a misunderstanding of norms, it was devoid of common sense and offensive to those of us who struggle every day to understand how to properly employ social media and the dialogue within. This is worse than spam. It was ignorant and unprofessional. I hope that Mr. Whittier takes a long hard look at this blog and learns something, assuming his employer doesn’t see it first. God Bless. P.S. If The Offending Party or His Employer Chooses to Comment On This Post, I Expect To Be Notified Immediately! Cog, you are always a rock star and have proven the strength of connections you can develop on Twitter and bring into real life. The sad part of this interaction….his company is a youth football camp. One can only assume what type of personality he teaches at his camps to teen boys. Bully tactics may work on the football field but one should learn when to push them to the side, especially in the business world. Well said. This is a tough one for me. I do think sometimes people do need to be called out in order to make them realize what they have done but the problem is people who do things like squatting hashtags usually know what they are doing. Pulling the “God Bless” card just totally annoys me. All in all, I think you handled this perfectly! When I received that message yesterday during the #prstudchat, I ignored it because I was interested in internships in the 90s. Later, when I saw the @ message again, I assumed he sent his message to those of us on the chat, not knowing who was a student and who was already eyeball deep in PR. I deleted the message and moved on… not giving it a second thought. 1. Take some time to get comfortable and familiarize yourself with “the rules” (though some are spelled out, many are unspoken, that’s the tricky part) before engaging. 2. It’s one thing to be a snarky or sarcastic when you are engaged in a fun conversation with folks. It’s a whole ‘nother thing to be snarky and sarcastic in an unprofessional attack on folks you don’t know. What an a**. I don’t like people like that on Twitter — they’re spammers. I tend to ignore them or block them. Eventually, it just goes away. You know thought, I’ve seen those “Twitter Wars” on television between celebs and I just refuse to let meyself end up like that. So I ignore those peopole. Good post though, I wouldn’t have had the nerve to call out people like this, myself. Once again, I apologize to everyone I offended. But to make a harmless error that only wanted only to offer job opportunities, just to be attacked repeatedly, AFTER apologizing several times, well one can only stand so much. And as I am NOT the PR guru at my company (nuff said) I was simply LOOKING FOR SOMEONE who could do far better than I.
I personally would like to thank @heybeotch(there’s a proud mom somewhere) for pointing this “Call Out” to me, as I wondered how I received 11 more resumes since 2 o’clock. I guess a good lesson for you students is that sometimes, bad PR can actually be GOOD PR. So again, I apologize and have learned a few valuable lessons. 1) Don’t go near any of these type of chat rooms, even if intentions are good. 2) Don’t get into arguments with people who have too much time on their hands. Keep the resumes coming and God Bless. Matt, while I commend your courage to leave a comment, I think you just proved even more reason behind your quest and lack of knowledge within the spamming and general communication. Majority of people on this blog are not students but rather professionals in the industry and TJ was trying to teach the students what not to do. I think you missed the point of PRCog’s post and didn’t read past the first paragraph. We are more upset with the fact you are attacking people, not only TJ, vs your error. Social media is not for every business as we are learning at the very moment. Best of luck to whomever may end up as your intern. I think Lauren’s got it right (below). I mean I wasn’t in the chat but I read this and, well you see my initial reaction above you. The thing about this is that it’s a hard lesson to learn, but it’s one that will prepare you better and prevent a mess like this from happening again. Sometimes the best intentions are executed poorly. I completely understand what you were trying to do, but it was the wrong way to go about it. Twice, boom! and you’re done. That’s two tweets, that’s about 10 people and you haven’t spammed anyone. You chose you audience and executed. — A single tweet with a link and good hashtags. “Looking for #entryPR? Then go to [http://] for more information!” etc. Not directed at anyone specifically, but those looking for jobs will search.twitter.com and find. — Look up the headhunters on Twitter and pass it along to them. And there you have it, 3 possible alternatives for future use. Take it or leave it: live, learn and grow. #1 – One should be able to take their serving of humble pie in proportion to what they’ve dished out. You sent out your message 85 times and apologized far less than that and are obviously not truly sorry about your conduct. #2 – You do NOT seek an intern for the purpose of abusing what they know that you do not. You seek an intern for a symbiotic relationship where you can teach, guide and polish their skills while perform industry related tasks to get practice under your supervision and guidance. Given what you’ve just admitted and your prior attitude what you were seeking is a slave or unpaid employee since you would not be able to hold up your end of an internship. #3 – Anyone who sent you a resume based on this posting is either a hoax or an idiot. Good luck with those resumes. #4 – Re: your #1 – yes, to put it in your terms – don’t walk on the field if you don’t know the rules of the game. Makes sense to me. Re: your #2 that’s difference between a Pro and a non-pro sir. It’s not that we have too much time on our hands – you likely spend more time waiting in line for tickets for your favorite teams than we do on these projects. This is our industry, these are our tools, it doesn’t take us any time at all. Just as I’m sure you can review a list of player stats and figure out very quickly who interests you, while we’d just be figuring out the abbreviations, we’re able to put these to immediate use. However, one additional note – There’s been a new flurry of responses to your comment. Do you really want any of your parents approaching you with a print out of your interaction the other day and then this response where you say you can only take so much? You do work with kids and so a short temper is not really a great thing. Or the local sports editor to give you a call and interview you about _this_ of all things (Thankfully myself and this group of professionals I’m honored to call my peers would not resort to tipping anyone off in your market). Or worse yet (particularly since you’re a family man it seems) to have the President (or investors/donors) of your company call you in to discuss it? Everything done here is public…even sometimes the things we think are private (we’ve all had a ‘dm fail.’ I, and I’m sure the others, would encourage you to keep on learning, but realize that like everyone else in the pool, it’s a continual learning process and mistakes will be made. The best we can do is laugh about it (or more accurately at ourselves), learn from it and move on. 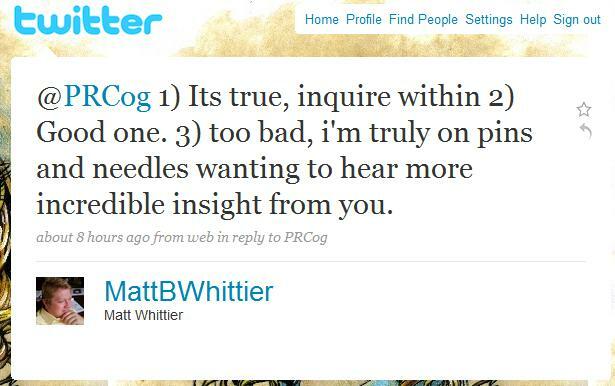 Matt – Another PR lesson: No Bad PR is ever good. This is how we get a bad rap. We don’t have too much time on our hands, as most of us are extremely busy people. You came into our chat and spammed everyone. Your intention might have been good, but it was executed poorly. We are defending ourselves, our friends and our industry. Beat That! I’d killed to have known about that one! Thats my daughter on my twitter page and on her name, I dont even know HOW to spam. Also I apologized earlier to TJ Dieterich for making fun of her picture, but it somehow didnt show up. It was inappropriate and unnecessary and I hope she forgives me. Thank you. Sasha’s a great one to learn from. Threatening me now, TJ? Dont take yorself so seriously. I would be embarrassed by parents from them just knowing i was on that site. The sports director at the Myrtle Beach Sun News will laugh at you. And the president of the company is easily accessible. Email me at odfraternity@aol.com and ill give you both of our cell numbers to call. He’d actually be impressed that I found such a dorky way to find interns, when in actuality, thats not my job at all. And finally, an old friend of yours Brian Feinblum at RF would be MOST impressed with how you spend your day. And dont forget your quote while you were at Emerson, “youre just a geek”. Just a side note, PRCog is not TJ. Thank you, Heather. I’ve been mistaken for worse people, but it’s nice for someone to set the record straight. No, it seems you’ve missed the point. 1) I’m not TJ 2) With the exception of withholding my name I’m 100% honest here, latitude I have because I withhold my name. Nice little yin-yang thing going on there. As for me….I wouldn’t bother threatening you…I would’ve just done it, and not stopped till it worked. But like I said, I’m not (and no one here) is doing that. See transparency, honesty, genuineness…. Additionally, TJ is much classier than I am…declaring that she’s me borders on libel. 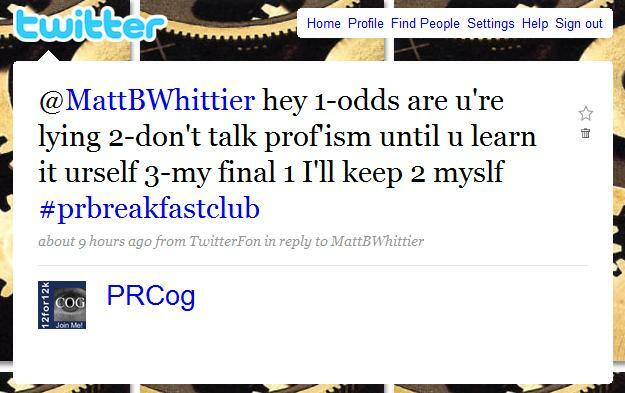 And your mention of RF is an actual threat, so let’s simmer down there Mr. Whittier. Further let’s not forget TJ’s job is in Social Media…they expect that she’s using these tools. If your company is ok with your conduct, then fantastic for them. For me though it just proves that researching a person’s twitter profile is more important than one might think. Well as not a follower of this blog, all I have to say is…. Hollla at the Smackdown! PRCog 57 Matt 0. Some words of advice sir Matt, don’t mess with anonymous people, they can break ya. The useless and fruitless threats going on here…well, they are just that. Did you really pull out the RF card, Matt? We are currently shaking in our boots. I’m all for discussion, but we have crossed the line into simply childish. (“Dorky way…you’re just a geek.”) You sound like the mean quarterback with a confidence problem pushing around the kid with the glasses. I’m going to echo everything Sasha said. Instead of telling you off, she gave you some basic tools to start off with on Twitter. Take those pieces of information, learn/apply them and move on. After being fwded these messages time after time, I regret just one thing: You never should have received any apology. If you cant even use your own name and throw your stones behind some fake, self-absorbed name, I’m not so sure I’m the one with the problem. I’m sure Mama and Papa Cog are VERY proud. You take advantage of this social media and allow yourselves to be as rude as you like, w/ no repercussions. You want to do as much damage as possible and desperately not get caught. I hope none of you in the Cog peanut gallery are future pilots flying planes around major governmental building or sky skyscrapers. You’re as pathetic as they were. But you all just keep patting each other on the back for your “causes”. And PRCog, you really are an innovator in this social media world, a regular Lewis and Clark for cowards. Very impressive, Peter. You’re gonna go far. Just keep telling yourself that and whining the entire way. You miss me!!! VERY much. 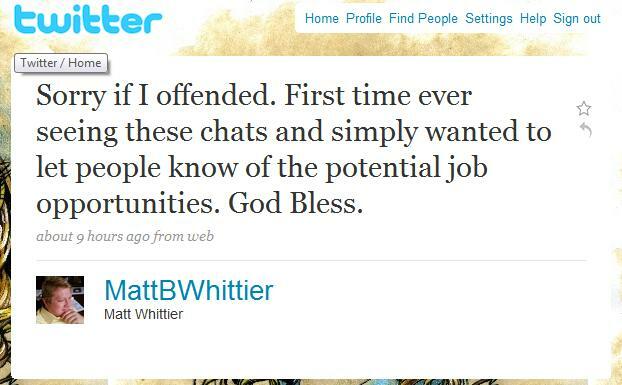 Soon there will be an entire “Matt Whittier Theory” with you people. I’m flattered. Keep up the great work, kids. Any other PR students interested in jobs and/or internships, Peter (perfect name for you) can get ya my contact info. Next Next post: Sorry for the delay….